As moderator of the school’s Astronomy Club – we call ourselves S.P.A.C.E. 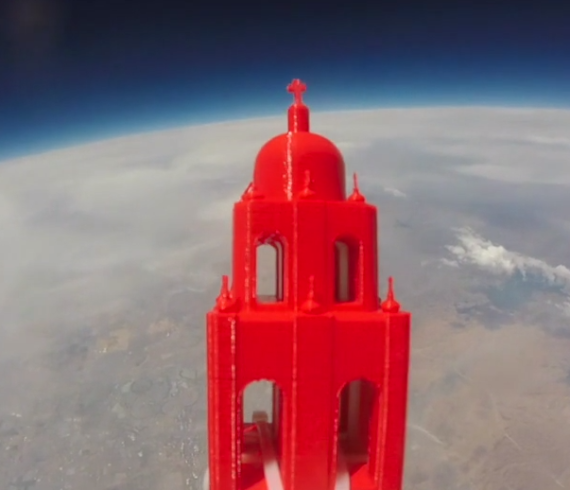 Student Planetary, Astronomy & Cosmology Enthusiasts – attempted to send a small 3D printed replica of our school’s chapel tower up to 100,000 ft and record its journey using a GoPro camera. After one failed attempt in which the satellite tracking unit failed to give a signal after launch, the club sent up a second balloon. The second flight was nearly pefect, and the group watched on their computers as the balloon sent back tracking signals as it crossed over the city. Despite the groups best efforts to keep the balloon from landing in a remote area, it ended up in the middle of the desert, where no roads or hiking trails were nearby. Roughly a week after launch, the team hiked for 7 hours to recover the payload. The group created the following short video showing off the great footage they received from the journey. Hope you enjoy it!